Samantha Leigh Dodemaide and company in 'The Wizard of Oz'. Photo by Jeff Busby. With a passion for musical theatre and a dedication to her craft, Samantha Leigh Dodemaide is a testament that dreams do come true as she steps into Dorothy’s sparkling ruby slippers in the new stage adaption of the iconic and much-loved MGM movie musical, The Wizard of Oz. 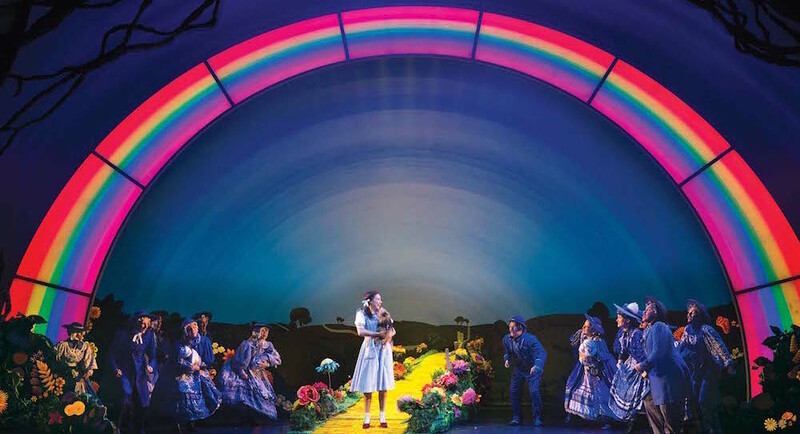 With an engaging storyline and award-winning songs including “Over the Rainbow”, which shot Judy Garland to stardom, this new production is set to do the same for this bright star. 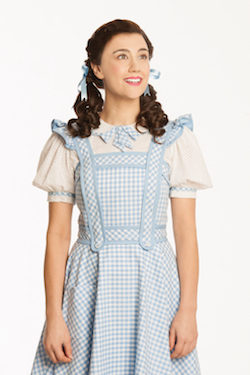 Samantha Leigh Dodemaide as Dorothy. Photo by Jeff Busby. While this marks Dodemaide’s first leading role in a major musical, she is no stranger to the professional stage. With roles in Anything Goes, Singin’ in the Rain, Sweet Charity, A Chorus Line and King Kong, she is also the recipient of the prestigious ANZ Trustees Rob Guest Endowment Award. The lovely Dodemaide recently chatted to Dance Informa, sharing her journey and wonderful experience as the leading lady in The Wizard of Oz. How did you feel when you found out you that you had won the role of Dorothy? How important was that moment for you? Tell us about your character Dorothy and what you enjoy most about playing this role? Do you feel any pressure to live up to Judy Garland’s performance in the movie musical, and what did you take from her performance that you’ve brought to yours? Samantha Leigh Dodemaide and Trouble in ‘The Wizard of Oz’. Photo by Jeff Busby. 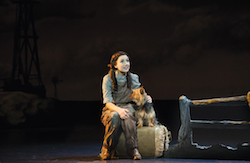 You get to work with a dog on stage, Toto! Have you had any funny moments? This production of The Wizard of Oz has been developed by Andrew Lloyd Webber and Tim Rice. What can audiences expect from the show? Do you have a routine that you follow on a show day to ensure you are performance ready? There are so many signature songs in the musical, including ‘Ding, Dong the Witch is Dead’, ‘Follow the Yellow Brick Road’, ‘If I Only Had a Brain’ and ‘Somewhere Over the Rainbow’ to name a few. What is your favourite song that you get to sing? You’ve transitioned from being in the ensemble of many musical theatre shows and understudying lead roles to now being the lead. What have you learned from those experiences that help you now in your first lead role? 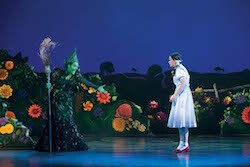 Jemma Rix and Samantha Leigh Dodemaide in ‘The Wizard of Oz’. Photo by Jeff Busby. What has it been like for you working alongside seasoned performers such as Anthony Warlow, Lucy Durack and Jemma Rix? What advice have they given you? What has been the key to your successful career in musical theatre? The Wizard of Oz is now on at the Lyric Theatre QPAC Brisbane and the Capitol Theatre Sydney from 30 December 2017. For more information and to purchase tickets, visit www.wizardofozthemusical.com. By Nicole Saleh of Dance Informa.